eBay Powered by Frooition FEEDBACK Kitchen & DiningTools & Home ImprovementHomePatio, Lawn & GardenClothingToysBeauty & Personal CarePro Audio & SoundPool & SpaSporting GoodsBabyCar Audio & ElectronicsConsumer ElectronicsExercise & Fitness Tahoe Gear Willow 2 Person 3 Season Family Dome Waterproof Camping Hiking Tent Part Number: TGT-WILLOW-2 Tahoe Gear Willow 2 Person 3 Season Family Dome Waterproof Camping Hiking Tent Main Features Durable 600mm polyester tent body is great for getting out in the warm or cool weatherCoordinating 600mm polyester fly with taped fly seams and polyethylene binding floor helps to provide water resistance in varied conditionsFly canopy extends out over the door for extra coverage.Easy to assemble shock corded poles and pin and ring system allow for quick set upOpen mesh roof area provides excellent cross ventilation throughout and allows the tent to double as a more open room during the day or night. DETAILS AND SPECIFICATIONS Explore the great outdoors and setup camp with ease in the new Tahoe Gear Willow Tent. Great for sleeping up to two, this tent is ideal for a quick and easy camping trip. Equipped with easy setup poles, stakes, guy ropes, and rain fly for unexpected weather, the Willow is ready to help you take on your next vacation or adventure outdoors. Easy to assemble shock corded poles and pin and ring system allow for quick set up High center and wall height allow camper to move easily throughout the tent Features Durable 600mm polyester tent body is great for getting out in the warm or cool weather Coordinating 600mm polyester fly with taped fly seams and polyethylene binding floor helps to provide water resistance in varied conditions Fly canopy extends out over the door for extra coverage. Easy to assemble shock corded poles and pin and ring system allow for quick set up Open mesh roof area provides excellent cross ventilation throughout and allows the tent to double as a more open room during the day or night. When the fly is attached, fly vents enhance ventilation to ensure you stay campers cool on hot summer days Includes convenient tent carry bag, pole bag, stakes, guy ropes and assembly instructions Does not include sleeping bag and backpack shown in photos Two pole design with pole sleeves and pin and ring system to make set up easy Sewn in utility pocket inside to store essential gear High center and wall height allow camper to move easily throughout the tent Note: Tahoe Gear tents are made with a high quality fabric for water resistance. Overall water resistance capability will vary by wind, setup and more extreme weather circumstances. Please ensure the rain fly is applied in inclement weather to decrease chances of moisture inside your tent. 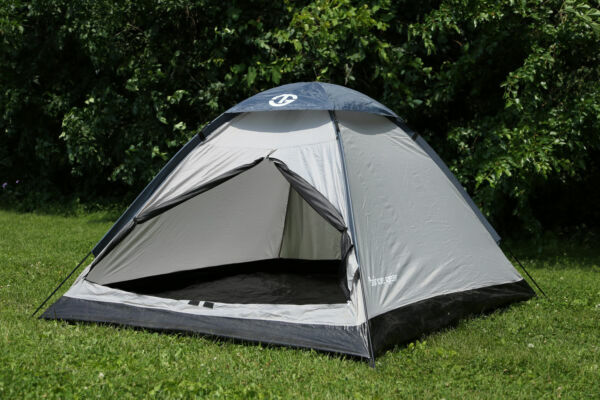 Specifications: Fabric Specifications: Tent Body & Fly - 70D/190T Polyester, Tent Floor - 120 Gram Polyethylene Assembly info: Quick setup Number of doors: 1 Number of windows: 0 Closure type: Zipper What&apos;s included: Rain fly, easy setup poles, stakes, and guy ropes Sleeping capacity: 2-person Seasons: 3-season Color: Gray Dimensions: Total dimensions (length x width): 7 x 6 feet Center height: 4 feet Part number: TGT-WILLOW-2 Manufacturer warranty: 2-year warranty Item Specifics Capacity2 Person BrandTahoe Gear MPNTGT-WILLOW-2 StyleDome ColorGray Features3 Season ModelWillow MaterialN/A SeasonGeneral Use Bundle ListingNo TypeSleeping Unit Country/Region of ManufactureUnknown Tahoe Gear Escape the indoors...explore new landscapes, create new memories with friends and family. At Tahoe Gear our goal is to create quality outdoor goods that exceed your expectations at an unrivaled value. The time your next adventure calls, we&apos;ll be there to help you make the most of it and enjoy the great outdoors. Shipping VMInnovations offers FREE ground shipping on all orders within the 48 states with no hidden fees. Most items will ship to Alaska, Hawaii, U.S. territories, and internationally for an additional fee, but please refer to the Shipping and Payments tab to view our shipping rates. With 5 fulfillment centers nationwide, most items are delivered in 1-2 business days and when you place your order before 3 p.m. EST, it will ship that same day. For freight shipments, please allow additional prep time and note that we require a phone number for delivery. FREE curbside delivery for all freight shipments. We ask that you please provide a physical address for your order so it arrives on your doorstep safely and soundly as we cannot ship to APO/FPO/PO box addresses. Our team will ship your order to the PayPal verified address provided, so any address change request made outside of PayPal is not guaranteed. VMInnovations ships with Fedex, USPS, Ontrac, Lasership, and United Delivery Service. Payment To view all acceptable payment methods and sales tax information, make your way to the Shipping and Payments tab. Cancelling Your Order: Your order is important to us and will be processed immediately. If you happen to change your mind after payment is confirmed, our team will do our best to stop the order, but VMInnovations cannot guarantee the cancellation. Returns Returning Your Order: If you need to return something, we will happily accept your return for a refund within 30 days from the day it was delivered to your door. If you miss the 30-day window, we can exchange your item(s) so that you can find something else you"ll love. Please see the Shipping and Payments tab for full Return Policy details. Return Process: 1. Submit return request via the eBay Returns Portal. 1. Find the item in My eBay under Purchase History and select Return this item from the More actions drop-down menu. 2. Select the reason for the return. 2. Please ship the product back to VMInnovations with all original parts. 1. Return shipping is the responsibility of the customer. 3. Our returns team will quickly ship your replacement or refund your payment. Please contact Customer Service for additional warranty information. More Items!View more great items Powered by Frooition Frooition Frooition | No-js Template | eBay design, eBay store design, eBay shop design, eBay template design, eBay listing design (ver:froo_no_js) This listing is currently undergoing maintenance, we apologise for any inconvenience caused.